Here’s how I gathered mine. In most cases when one writes an article on current events, it is easy enough to link to a current news story as a source. However, history isn’t a current event and the sources I’m writing about in that regard aren’t online. Or they are in scattered bits and pieces on websites I can’t vouch for. Thus I’ve put together this page to detail my historical sources. 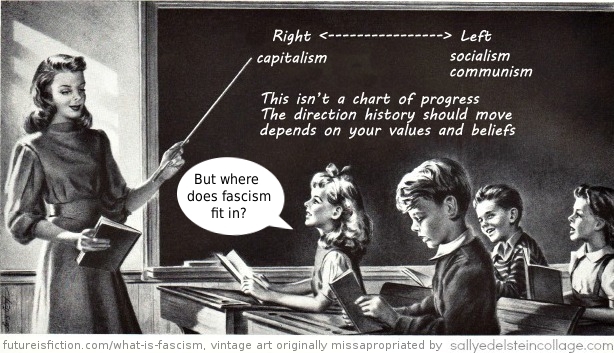 Much of my understanding of what fascism is was shaped at Florida State University where I have a degree in sociology. However I don’t feel this is sufficient as a source, so I’ve been reading up since 11-9 to further the depth of my understanding. I’ve read many of the sources a curious reader would turn to on the Internet, such as Wikipedia and historians discussing fascism extensively on Reddit. Of course these sources lack academic rigor, so I’ve not included them here. But they did amount to hours of reading on the intricacies and debates of this historic period. I’ve also dug into the sources on Wikipedia itself, which are fine…but I wonder if someone wanting to question my research will look askance at text on an ugly and unknown web page (such as buried deep on a university website, or the site of an author who wrote a dissertation on the Third Reich) when they are accustomed to links that come from recognizable news sources. There are plenty of news sources discussing the rise of American fascism, but those aren’t sources to the history itself. History from before the Internet can’t be so easily linked to without the use of Wikipedia, which I am aware many people aren’t fond it. Yes I know right is on the left; the whole point is that it isn’t to be read directionally. The gist of this series is not to outline bullet points of fascism from a historical perspective. Rather it is to point to the rise of a certain philosophy today that has echoes in the philosophies behind the atrocities of World War II. These philosophies, regardless of their historic precedent, are inherently dangerous. Thus I am less interested in widespread linking to Godwin’s Law comparisons (look! Someone wearing a brown shirt! Just like the Nazis did) than I am in thoroughly documenting examples of these philosophies as they are happening now. In those cases I will link directly to the source in the news. 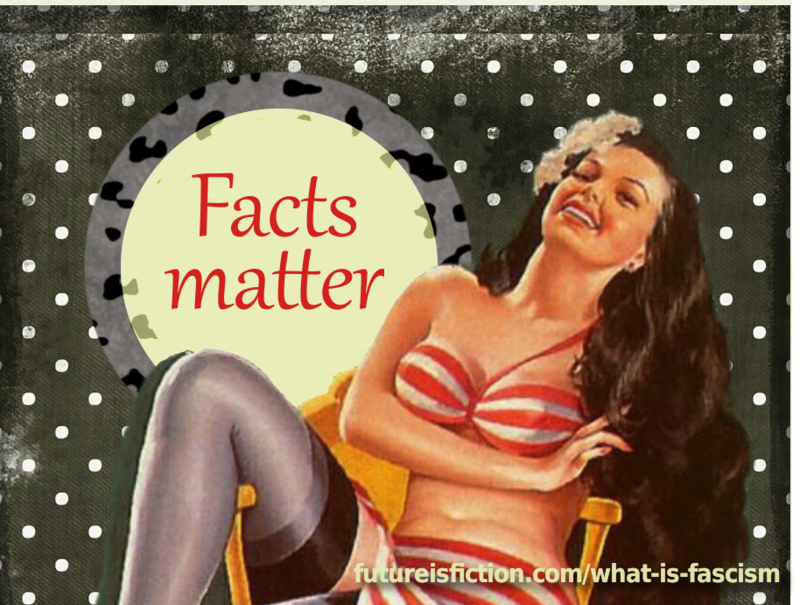 On current news sources, I am willing to engage in a certain amount of meta-conversation on accuracy of my sources and what can or should be defined as “fake news.” Those are important conversations to have. But ultimately, many of the things I describe need not be disputed for source, because Trump’s biggest supporters don’t dispute them (naturally I will source them regardless). The things I describe are often part and parcel of why they voted for him in the first place. That’s where the need comes to make these historical comparisons. For the first post on the definitions of communism and socialism I am reliant on extensive reading during my studies in college. This includes the writing of many political philosophers including Karl Marx, Peter Kropotkin, Trotsky, and many others. I confess I am so acquainted with these definitions that I thought they were common knowledge. I recommend these historical sources as unimpeachable in supporting the statements in the American Fascism series and the authority of what fascism means. Eco lived through fascism in Italy. He’s also widely respected as one of the greatest literary scholars of the 2oth Century. Because the word “fascism” has been thrown around so much as a vague insult, Eco sought to lay down the common characteristics in this essay he wrote for the New York Review of Books. Since the founder of fascism wrote in his own words on what fascism means to him, it makes sense to read his short essay. No blog post interpreting fascism can have more authority than the man who started the concept. If you want to know what fascists believe, Mussolini will tell you. In researching this I thought it important that my writing be supported by a full-length book written by a reputable historian. I’ve chosen Evans, a historian from Cambridge University. While there are hundreds of books about Nazi Germany, Evan’s The Coming of the Third Reich (the first in a series of three) is the most widely lauded book specifically on the culture and events that lead to the rise of Nazism. It is both critically and reader-acclaimed. The book is even-handed; he rarely imposes his own views, letting the historical sources speak for themselves.